In this fast paced world, you should not have to settle for anything less. 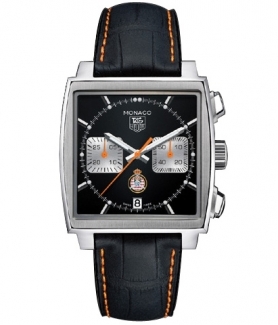 The Swiss-made Mens Tag Heuer Monaco CAW211K.FC6311 Timepiece‘s lightning fast, sleek design is far from conceding. Crocodile black leather straps encircle your wrist with matching red orange racing stripes down the outer edges. A stainless steel clasp holds the latest raceway tightly onto your wrist for presentation. The watch ranges in list price at around $4000, not bad for a limited-edition. Attached at the center of both straps is a beveled square, silver, stainless steel case. To the left of the casing, you will find a 2:00 start pushbutton, 3:00 winding crown and 4:00 stop pushbutton. Atop the case is a scratch-resistant, durable sapphire crystal. The entire case is every day splash-resistant. Inside the glass, the black dial glistens in the sunlight. Each hour is illustrated by a large white notch and a circle in place of the smaller markings showing minutes. A date calendar proudly stands at the six o’ clock placeholder. Inside of the time-telling circle of notches are two rounded rimmed rectangular chronographs measuring the seconds and minutes as a stopwatch would. These are located in the center left and right. Above the calendar, a circular, tiny hour counting chronograph is featured. 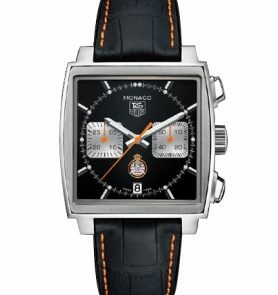 At the top right of the inner circle, the latest Monaco, Tag Heuer logo is lightly sketched in. Outstretched from the center point are two luminescent white hands with pointed tips just barely reaching the smaller set of notches. A red orange second hand, to match the racing stripes down the straps, furiously clicks clockwise every minute. Originally introduced in 1969 in honor of the Monaco Grand Prix, the Monaco was iconic for being the first automatic and the first square cased chronograph. 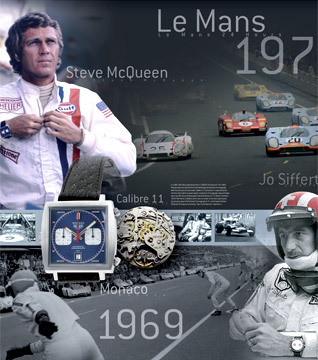 Whether you have the urge to calculate how fast those NASCAR vehicles are really flying past you or you just want to time how long it takes your child to tie their shoe, the classic chronograph stopwatch will come in handy. There are only a few downfalls to this stunning timepiece. The main issue is it is hard to read the chronograph meters, because they are so tiny. The markings in place of numbers makes the entire watch more of a collectors’ edition than a functional work, but it is legible enough if you look closely. 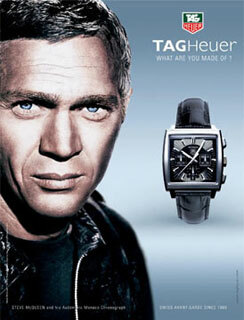 Tag Heuer intricately strewed this masterpiece together for more than meets the eye. Other than the minute numbering, the watch features the crown in between both the stop and start buttons. This concept was later scratched, and the crown was again placed alongside the nine o’clock dot. Many knock the watch out of whack when using the start stop feature, because they are concentrating on the task at hand that they are timing, relying on touch to make sure they hit the right buttons, but like fine wine, this collection has improved with age. Like Steve McQueen, this function-first timepiece, is a classic. It’s sleek black and silver coloring can be worn against a suit and dressed down with a t-shirt on the weekends. There is no doubt in my mind that you will be impressed with your purchase.